I’ll just come right out and say it: mother! is one of the very best films of 2017. It’s demanding to say the least, but it’s also accessible so long as you’re willing to appreciate the tastes of the artsy crowd and to contextualize its bizarre methods. At times this allegory is as straightforward and on the nose as possible and at others it is frustratingly interpretative (evidenced by the moans and groans from my small matinee crowd and it’s dreadful F Cinemascore from audiences). At the end of the day, it all boils down to a hallucinatory vision that’s been totally and wholly realized by filmmaker Darren Aronofsky. This is the kind of nightmare that we’ve all starred in at one point or another – helpless and subjected to predatory eyes – except here the fever is lucid and warm and alive. mother! isn’t the horror show its marketing bills it as, but on a deeper level it’s a terrifying depiction of incredulous belief and silenced frustration. And that’s just the very tip of this Kubrickian iceberg. What lies beneath is haunting. She (Jennifer Lawrence) roams the halls of this once burnt-down manor. It’s been entirely rebuilt by her hands alone, or so we’re told, the skylight refinished and the eventual nursery’s wall paint an easy choice between a flat tan and an alive yellow. She opts for color, and as she makes the restorative decisions and the decorative choices for this flip or flop, they’re left riled and undone by her writer’s blocked husband (Javier Bardem) as he extends an open invitation to strangers at the door. First comes a supposed doctor (Ed Harris), then his wife (Michelle Pfeiffer), then their kids (Brian Gleeson and Domnhall Gleeson). They are the unwelcome. And yet, despite all of the misgivings, they can’t seem to leave. It feels deeply connected to Luis Buñuel’s 1962 surrealistic satire The Exterminating Angel, a film about dinner guests who for no reason at all can’t exit the house they’ve entered. 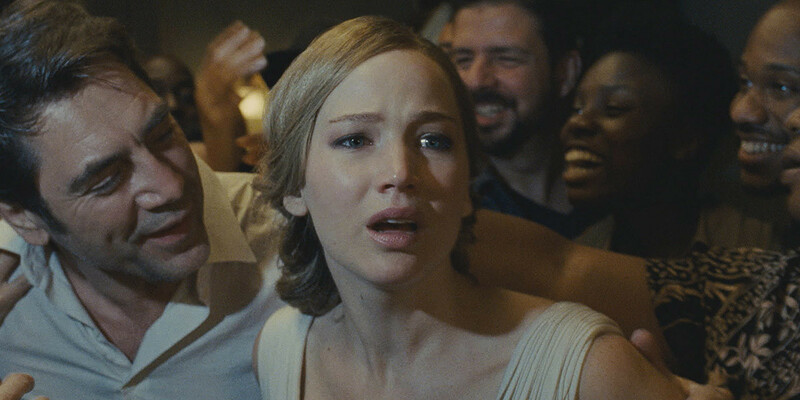 In Aronofsky’s mother!, the plot is slightly less surreal – although no less inexplicable – and instead functions on two defined allegories: one a literal retelling of the Bible (both Old Testament and New) and the other a self-reflective criticism of celebrity culture. So yeah, this one’s a doozy. As you might have guessed, there is a lot to unwrap in this film, and I think it’s one of those rare viewing experiences that somehow demands an immediate re-watch to fully appreciate all of the nuances that are hidden and sometimes openly forthright throughout. What is going on exactly? Is this just one big bad dream? It can’t possibly be real…or can it? That mother! inspires such bold and heady questions of its audience is worth a recommendation alone, and that it follows up on them with an allegorical exegesis is nothing short of masterful. Darren Aronofsky is an outspoken Atheist – an alignment that you can almost touch in every single one of his films – yet he also seems to acknowledge that despite different faith affiliations and spiritual compasses, religious texts have their own kind of beautiful prose. He may curse them and shake his fists at the Heavens, but he still recognizes their presence, and he isn’t afraid to take a stance on something as ubiquitous as love or as personal as belief. Aronofsky is an auteur, and I’ve never felt as privy to his own opinions or his mind as I was while watching the surely divisive mother! Here’s where things get tricky when reviewing a film that literally begs to be understood. If you haven’t seen the movie, I suggest that you skip this paragraph. And if you have, I ask you to stay with me. So, SPOILER ALERT!, Lawrence’s character represents Mother Earth, Bardem’s is an iteration of an all-knowing and omnipotent God, and the film is a pessimistic and cyclical travel logue ending right where it starts but only in a slightly different shade. The early visitors embody mainstays in the Christian canon (Adam, Eve, Cain, Abel) and demonstrate the inadequacies of humanity (biting the apple, Original Sin, killing thy brother). These connections are layered and quite obvious if you’ve ever attended a year’s worth of Catholic masses. But where Aronofsky diverts from overt religious parallels is in this oeuvre’s cataclysmic final third. He takes us on a whirlwind tour condemning organized religion, war, fame, fossil fuels, loyalty, overpopulation. And then we rise from the ashes to begin again. Take note of that very first shot; it’s Mother Nature looking directly at us, burnt to ashes, shedding a single tear, saddened that she’s been so intentionally abused and thoughtlessly consumed. This film is a tragedy in every single regard. For nearly its entire runttime, mother! keeps the camera claustrophobically close on Lawrence’s fresh face, so much so that anything outside of a close-up shot feels intentionally devoid of her presence, and boy does she nail this performance. She’s soft-spoken, so internally opinionated (her eyes speak more than she ever does), and so intent to please but unable to give as much is asked of her. This initial weakness evolves into a deep and empty melancholy, especially while she’s habitually undermined by her husband. He’s a poet – a well-known creator – and with Bardem’s seasonal grin guiding his largely absent and self-righteous character, Aranofsky critiques himself as well as other true artists. He damns any and every form of God, repealing and replacing a deity’s love for its creation by first prioritizing its own need to be praised for creating humanity in the first place. This is a movie about a mitigating ego, about the active subjugation of the id, and about the effects of religious practices on the super-ego. It’s Freudian and it’s weird and it’s taxing. mother! is a psychoanalysis that’s worth the effort and the cost. I started watching Rosemary’s Baby for the first time the morning before I saw mother!, finished it in the early twilight hours the next day, and I’m still a bit speechless by how similarly patterned the two films are. Seriously…watch these back to back; the plots are devilish twins (that drink Lawrence’s “She” concocts in duress seems to be an ode to Rosemary’s tannin laced good luck charm). Granted, Roman Polanski’s picture is more of a slow-burning rumination on male gratification while Aronofsky’s head-trip is a full-blown dip into a crazed fantasy fighting against a nurturing fertility – of the womb and of the Earth – that is constantly undervalued by a creator/partner who makes masterful work but doesn’t know how to care after it’s been published, let alone capable of knowing how to shepherd the flock of admirers willing to make the pilgrimage to see their God. mother! is manically depressing from Lawrence’s POV and maniacally framed from Bardem’s smug place atop his altar, and although I can’t bring myself to call it a masterpiece, it’s still an undeniably gripping and conversational work of a master. Its misanthropic mindset and macabre heart beat in tune, and it’s horrifically divine.